I just want to let you know how much I LOVE your Sea Specs. 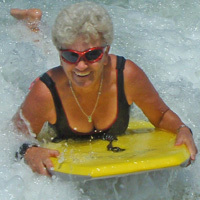 I am a 65 year old Boogie Boarder (not exactly extreme sports), but I do get dunked quite often. I usually wear cheap sunglasses with elastic around the back (often lost) but your Sea Specs are just amazing! I do not even have to wear a sun visor now as they are such a good fit and keep the sun well out of my eyes. I bought the 3 pair s & I have already worn the red & the white ones. JUST FANTASTIC. Good products are hard to find but this one I truly recommend.